Research on language and brain development shows that the number of words a child hears in the first three years determines their academic success later in life. Babies are learning all the time, so how and how much we talk to them is really important because words don’t only help them to create an understanding of the world, they are also helping their brains grow. Unfortunately not all children are exposed to the same kind of language environment in the first few years of their lives. Children born into poor families hear 30 million fewer words on average before they reach the age of three than children born into wealthier families. This difference causes an achievement gap and according to the experts this gap cannot be closed later in life, in fact chances are that this gap will widen. In the United States an initiative of parent talks has been launched to help parents regardless of their socio economic status understand the power of talk. It is important to know that sitting a child in front of the TV is no replacement for human interaction, stories being read to them and being engaged in conversation. Babies learn a lot from being talked to long before they speak back. 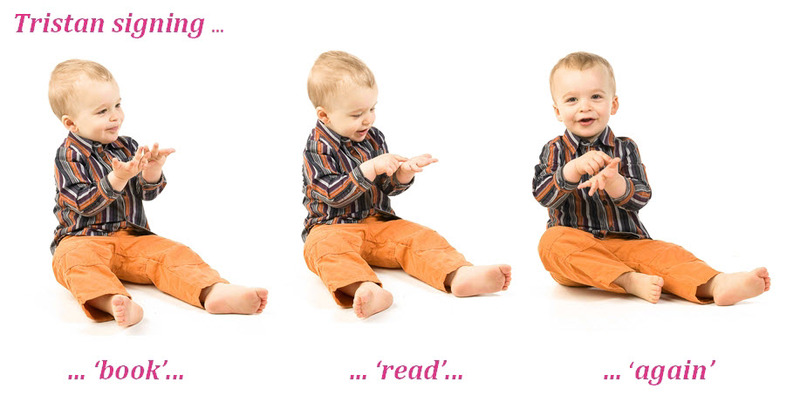 The use of baby sign language is wonderfully complementary with exposing your child to lots of words every day. Sing language makes it very easy to use lots of words and use the same word in many different sentences. When you simultaneously speak and sign with your child, you engage both hemispheres of the brain (the language centre is located in the left brain hemisphere whereas the visual input is processed in the right hemisphere of the brain). 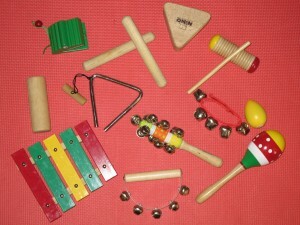 This stimulates brain development and brain hemisphere integration. Children are able to use their hands to communicate a long time before the complex musculature needed for speech develops sufficiently for clear communication. This does not only put the child in the position to practice the active use of language much earlier, it also comes with the advantage that you can understand your child long before speech is an option. The benefits of that are priceless! At seven months Briana started bringing her hands together in what resembled a clapping motion. 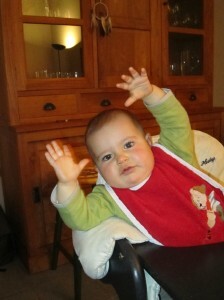 She is now seven and a half months and happily clapping at any opportunity. She looks very proud about herself when she sees our encouraging reaction. We have been practicing clapping along to the German children’s song ‘Backe, backe Kuchen’. Now it seems that she wants me to sing the song when she claps, testing action and reaction. Clapping just like waving hello and good bye are gestures that we naturally teach our children. Using signs when we communicate is simply taking this a good step further. The clapping motion is a good preparation for symmetrical two handed signs such as the sings for ‘more’, ‘hurt’ and ‘ball’. Bringing the hands together at the center of the body assists in mid-line alignment which is important for balance. This motion also promotes left (logical) and right (intuitive) brain hemispheres working together. I have been signing with Briana since she was about 4 months old and she has clearly been showing interest in my hands and fingers for a while. 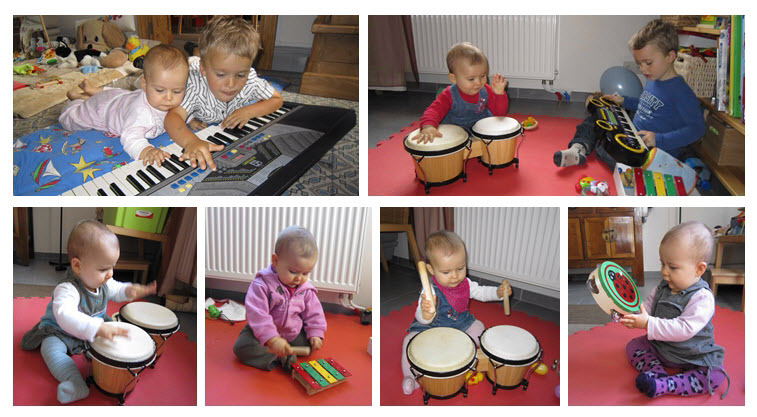 Today for the first time (at 6.5 months) she has been studying her hands very intensely. It was after her lunch and we had just practiced signs for ‘eat’, ‘drink’, ‘more’ and ‘all done’. She was still sitting in her high chair so her hands were free to move. She kept looking at her hands as she was slowly moving them and her face seemed to say, ‘wow, is it really me moving these? How fascinating!’. It was wonderful to watch. She also sat unsupported for a good while today and thoroughly enjoyed it. I can’t wait for her to start using her hands to communicate with us. 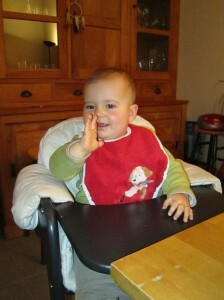 My little daughter, Briana, is six months old now and she is so excited about being allowed to sit in her high chair. If it was her choice, she would have been in that chair much earlier :-). For me the chair came together with introducing solid foods to her. She is still a little wobbly but loves eating from a spoon and drinking from a cup. And I love the fact that she is facing me at meal times. This opens up a whole new possibility for signing with her and I have introduced the following meal time signs: eat, drink, more, all done. When she is not distracted by her brother, Tristan, she is fascinated with my hands. I’m soooo curious as to when she will start to sign back and what her first sign might be.